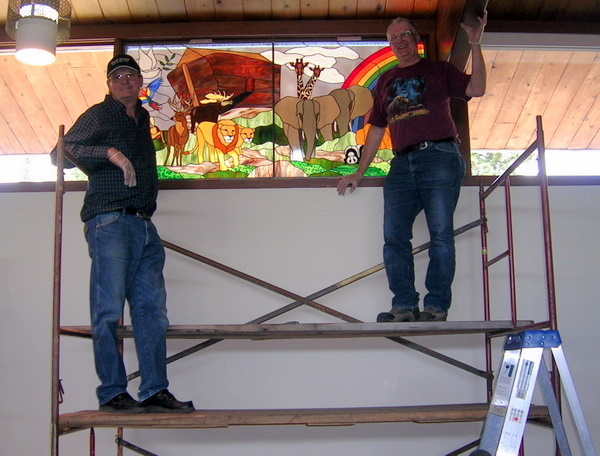 In the late fall of 2014, we were asked to see what we could do for a large church window for “The Gaetz Memorial United Church” in downtown Red Deer Alberta. The church recently installed new main entrance doors, with 2 large windows above these doors. The church committee provided us with sketch design concept. 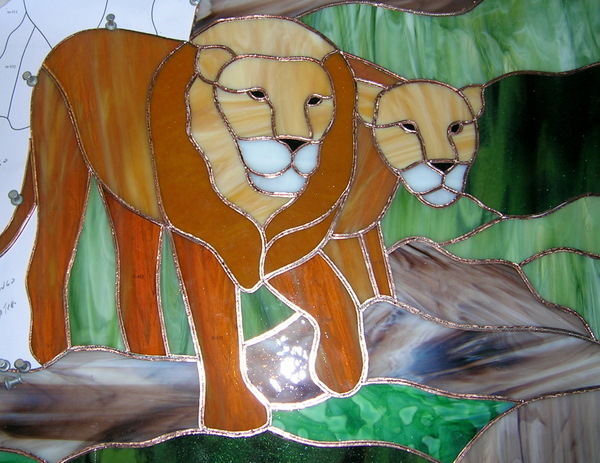 We once again enlisted the stained glass design experts at Paned Expressions Studios Inc. in Edgewood Maryland USA ( http://www.panedexpressions.com ). Martha Hanson and her design team came up with the “Alberta Welcome” design. These 2 panels each measured approximately 6 feet wide by slightly over 2 feet high for a total of some 25+ sq ft of stained glass and contain nearly 600 pieces of glass. 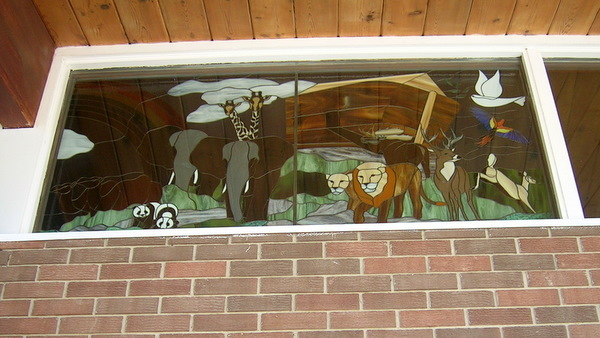 The windows were a memorial gift from one of the congregation members. This is the left panel of “Alberta Welcome”. The concept was to show a sweeping design across Alberta and as the windows faced south it was perfect to do this. On the left side of the left panel are located the Cypress Hills of South Eastern Alberta along with a lake in that area, our famous Alberta Roses, and the badlands near the Drumheller area. A road was designed to run up to a church located within the rolling fields of wheat and canola. The blue piece can be visioned as either a flax field or one of many sloughs located in this area. The unfortunate part is that we are unable to get a full photograph of both windows together. The reason being that there is a staircase descending to the front doors on the left side with a wall on the right side, then another set of stairs descending to the church basement. The right panel picture had to be taken from the descending stairs into the church basement which distorts the view somewhat. The 2 panels were designed to flow together therefore some of the crop land and parkland continued into the slopes of forest and foothills rising to the mountains. The mountain is Mt. Rundle located in Banff National Park with its reflection in Vermillion lakes and is a world famous sight to see in our Rocky Mountains west of Calgary, Alberta. To give you an idea as to the scope of this stained glass window here is a picture of them together as they are above the doors of the church, however as stated above not a true indication as to how they look. If you are ever in Red Deer a visit to the church would be very worthwhile, not only to see “Alberta Welcome” but the church sanctuary which has some of the largest and most beautiful old stained glass windows in Central Alberta. 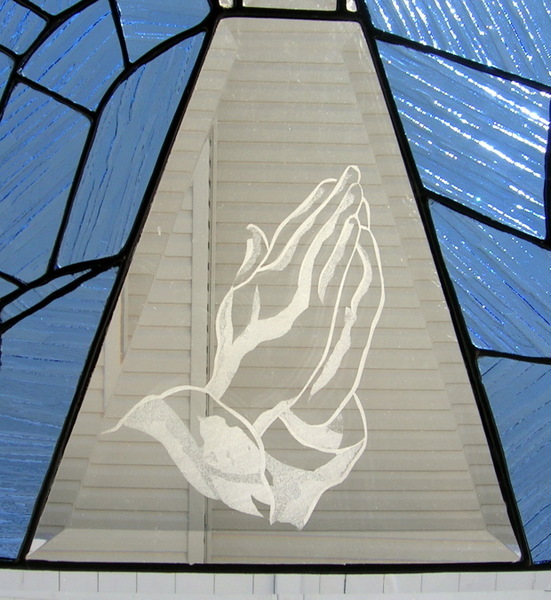 We are grateful for the opportunity to do this window for the Gaetz Memorial United Church located at 4758 Ross Street in downtown Red Deer. This “Alberta Welcome” would not have been possible with the outstanding help and design talents of Martha Hanson and her team at Paned Expressions Studios Inc.
Quite a few years ago the United Church in Innisfail was making a small model of a church, which if memory serves us correctly, was going to be auctioned off as a fund raiser. When we saw it we decided to help by adding a small stained glass window which would add to the authenticity of the model church. This was our design. 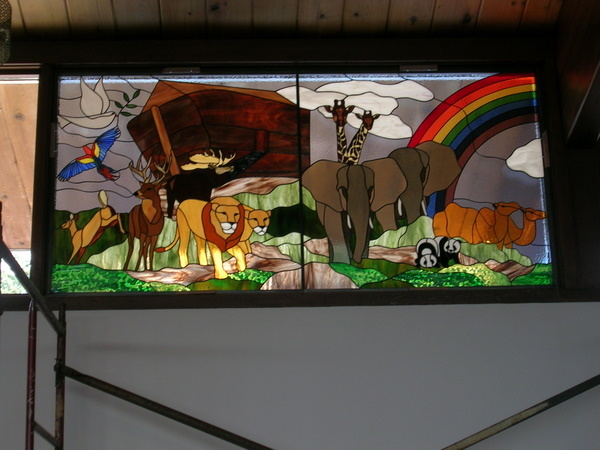 In the fall of 2010 we were asked to see what we could do for a large stained glass church window for The United Church in Rimbey Alberta. We provided some conceptual ideas which the Church committee, tentatively agreed upon. 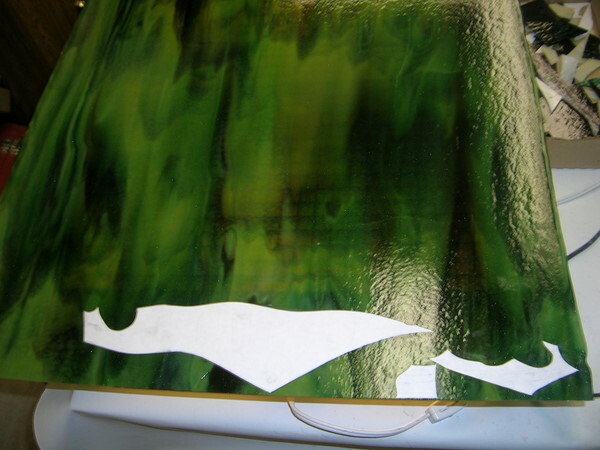 We then enlisted the stained glass design experts at Paned Expressions Studios Inc. in Edgewood Maryland USA. ( http://panedexpressions.com ) Then Martha Hanson and her design team came up with the “Noah’s Ark” design. This large church window measures some 78+ inches wide by 37+ inches high, is approximately 20+ sq. ft. and has some 530 pieces of stained glass and was constructed in 2 panels in the first half of 2011, with installation taking place in late June. This window was a memorial gift to the church by a 90 year old member of their congregation in memory of her husband. She was in attendance when we installed this window and she and the church members were extremely pleased with this wonderful addition to their church. We are going to lay out below a photographic journal of the window being constructed, installation and the finished window. We also wish to sincerely thank Paned Expressions Studios Inc. and Martha Hanson for their wonderful design and their dedication and support and help for our studio in our endeavors to create this Biblical scene. The installed window faces north and the church has a large roof overhang, which depending on the time of day and current weather conditions can change the blue sky to greys. As the minister of the church said it is rather neat in that it appears that the storm clouds are lifting and sunshine and blue skies beckoning. Next picture installed before scaffold removed. It was a cloudy day when we installed the window and this coupled with the large overhang and that the window faced north produces many sky color variables. Next picture taken from outside the church looking at Noah’s Ark. 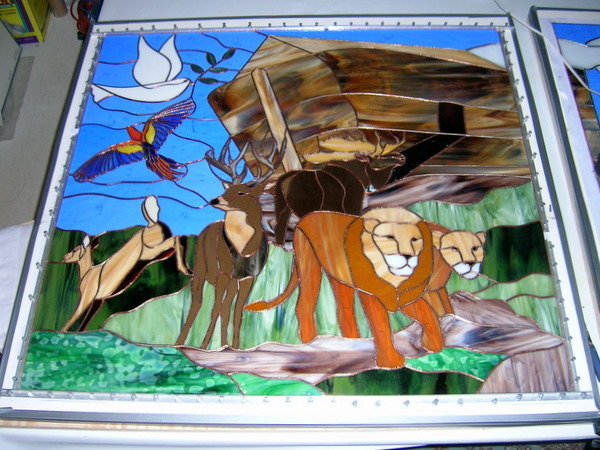 You can see the matching of the glass between the 2 panels especially in the ark. 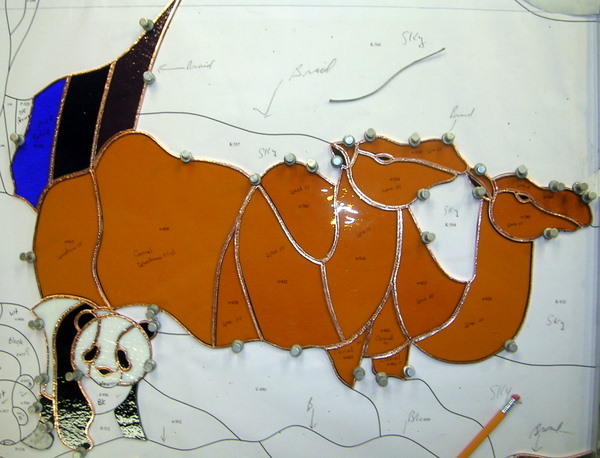 “Noah’s Ark” had to be constructed in 2 panels, we started on the right panel first in early 2011, this picture shows the 2 camels and the start of the Panda Bears. 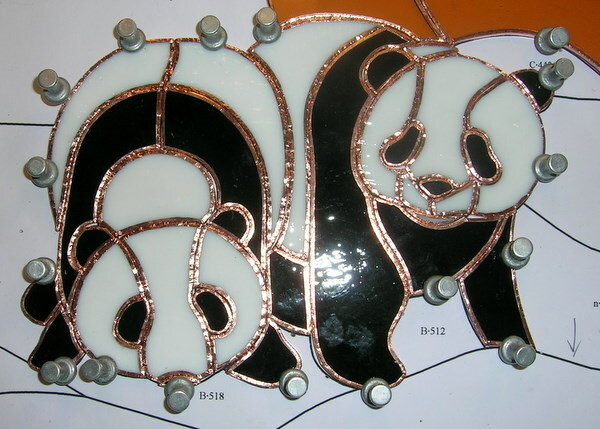 The Panda’s pieces of glass have now been all fitted and foiled. 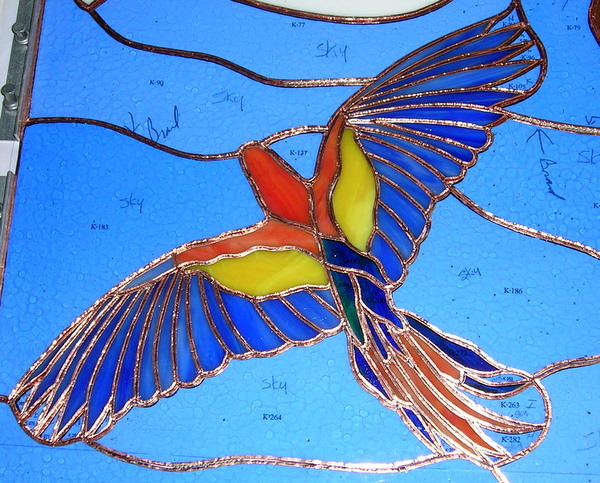 We are very meticulous when building our stained glass panels. After laying out the pattern (we use 2 layers of white, smooth ceiling tile duct taped together) in the case of Noah’s Ark we made separate sized ceiling tile panels which were overlaid on 3/4 inch plywood. After carefully measuring numerous times we outlined each panel with Morton Layout Blocks. We then decide where we wanted to start construction and we trace (using a pencil) the first piece from the pattern by overlaying with white freezer paper which is fairly transparent. The paper is held in place with push pins. 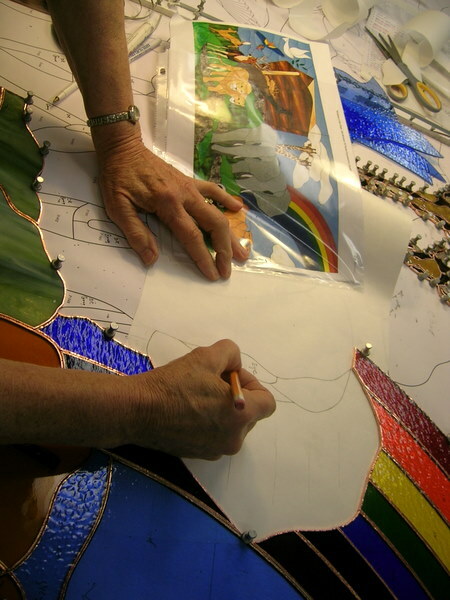 We then cut out the that traced piece and using Elmer’s All Purpose Glue Stick adhere the freezer paper to the glass we have chosen, ensuring that we have the flow of the glass that we want decided upon. Many times we actually put lines on the freezer paper to ensure the correct way we want the glass to look. 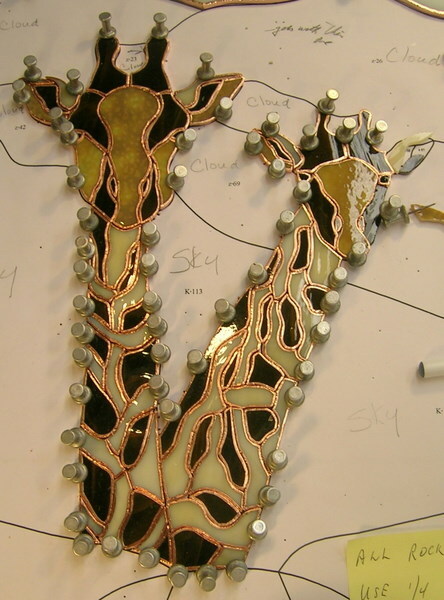 If there are pieces that we need to match we will trace out the areas and put those pieces together on the glass with nominal spacing to ensure proper matching and glass flows. 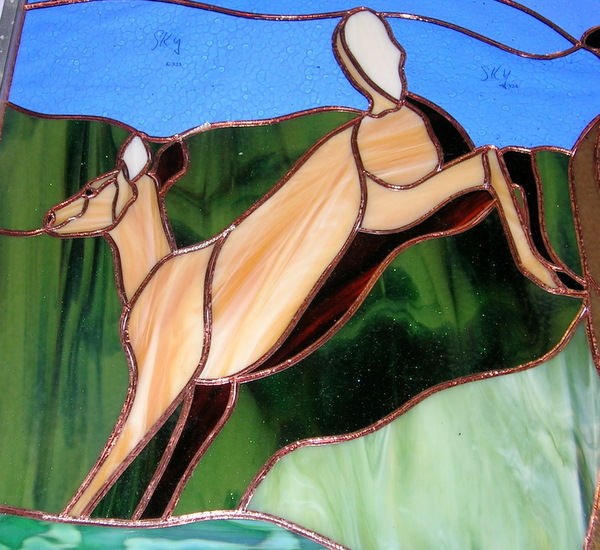 You will note with the glass pieces in the center of the design that they match across the 2 adjoining panels. We then grind the piece with the freezer paper glue to the glass, remove the paper then fit to the pattern. We then foil and burnish that piece of glass. Then we place freezer paper under the finished piece and trace the next surrounding piece or pieces, repeating the initial grind with the paper on the glass then exact fitting followed by foiling and burnishing. 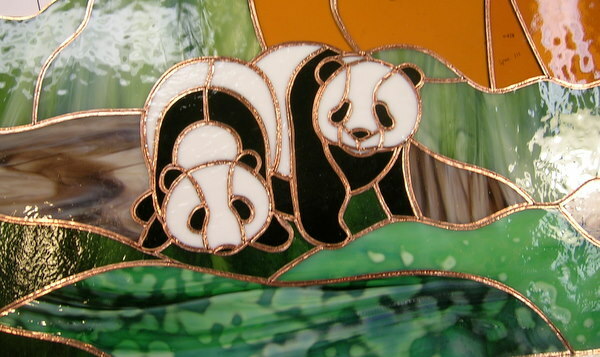 While this maybe in many artists minds a slow methodical process, we know that it allows for great fitting panels with consistent even solder lines, and very seldom when soldering do we have any solder run through to the reverse side of our panels. 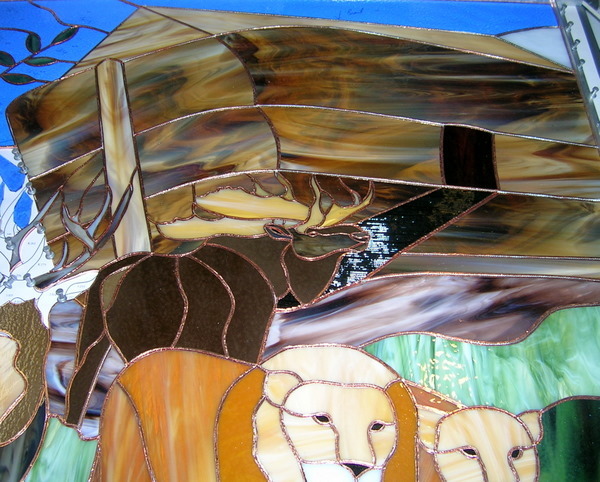 In Noah’s Ark we also installed between much of the glass In-bedded Strengthening Braid. Next picture shows the freezer paper glued to glass. 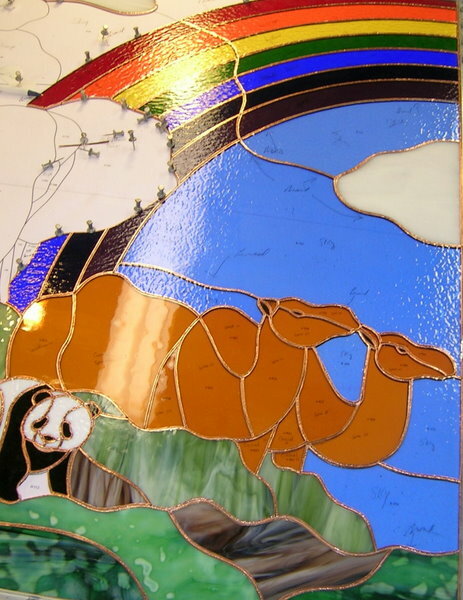 This is the Right Panel of Noah’s Ark, all ready for soldering. The left side pieces of this panel were all cut and matched to those that are on the right side of the left panel. 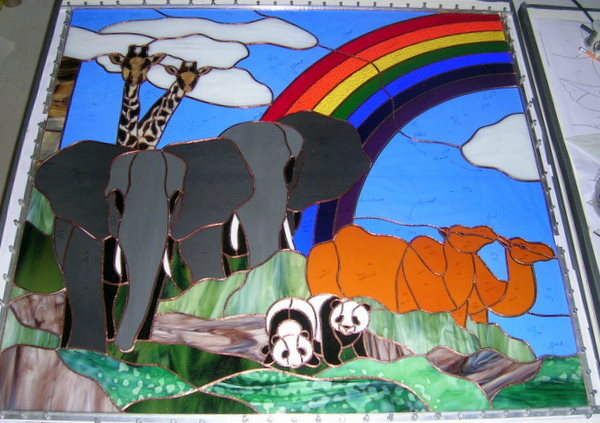 This panel features the rainbow, elephants, giraffes and panda bears. The Rimbey United Church is located in West Central Alberta and the Church Committee wanted some Alberta Wildlife, so we included a Bull Moose, Buck Deer and Doe, pictured above is the Ark with the Bull Moose. The church committee wanted to offset the rainbow on the right side with lots of color which was incorporated in this Parrot. Next picture Noah’s Ark being installed. The church was most helpful in arranging scaffold, ladders and help for us during the installation process. We rented a van to transport the 2 panels which were very well packed but had to stand upright to ensure safe travel and that is the only way large glass panels should be transported. Next panel installation of wooden molding to secure the window. We provide wooden oak moldings which the church stained to match and these were cut to fit and put in place to hold the window in. The panels were surrounded with 3/4 inch Zinc Came with 1/2 inch H came in the center, with one panel slipping into the other. Each foyer window that the 3 of us constructed for Markerville’s Historic Church contained bevels, on one window Laurie Chilibeck etched the Praying Hands. When Laurie Chilibeck of Sylvan Lake heard about the devastation from the 2006 hail storm in Markerville, she knew there was only one way to help that community. 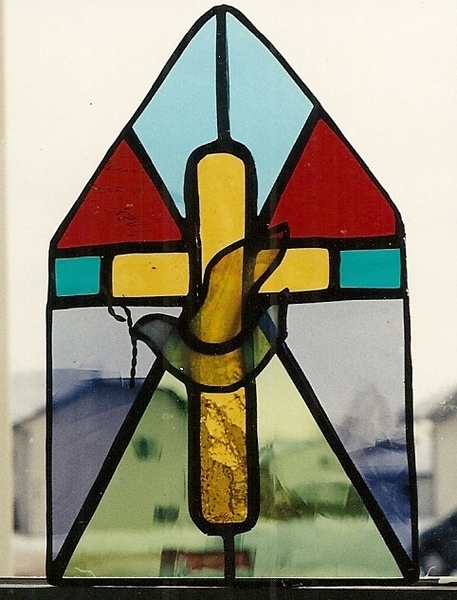 Through her talent and vision, she took the broken pieces of antique stained glass from the Church and together with her fellow stained glass artists, Bob & Flory Wilkins of Innisfail, put them back together in a statement of their survival. 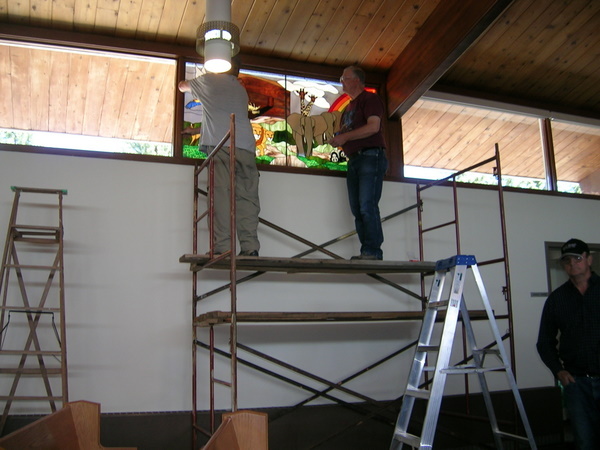 After many hours of cutting and assembly, two stained glass window inserts were created for the foyer of the Markerville Church. These beautiful creations will be dedicated during the 100th anniversary of the Church on June 16, 2007. One window has red glass in the beveled cross, signifying the blood of Christ, a reminder of the suffering and sacrifice of the Son of Man. This window also has etched Praying Hands in the large bevel representing our prayers to God. The other window has purple glass in the beveled cross, symbolizing Royality; God the Father, Emblematic of suffering and endurance. Christ was believed to have worn purple garments before his crucifixion. 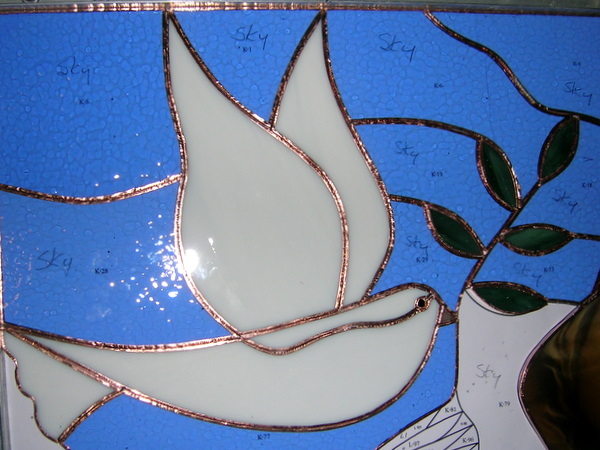 This window has an etched descending Dove representing the Holy Spirit and Peace and our Blessings from God. The original church stained glass windows were comprised of the colors of blue, amber and green. We divided the pieces equally between the new windows and by assembling the broken shapes, created these two designs for the 100th anniversary of Markerville’s Historic Church. We would like to extend a big thank you to Robert Bryce our master wood worker friend from Innisfail, who installed these windows for us. The quality of each piece is superb and we will enjoy forever.